Cockroaches are considered dangerous pests primarily because of their ability to infest homes and spread disease. Because there are various species of cockroaches, the insects are frequently confused with beetles and other types of creepy crawlers. However, there are certain factors to look for in identifying members of the cockroach family. Cockroaches have broad, flattened bodies that are typically oval-shaped. The insects have a prominent, shield-shaped area near their head called the pronotum. Adult cockroaches generally have membranous wings, although not all species fly. 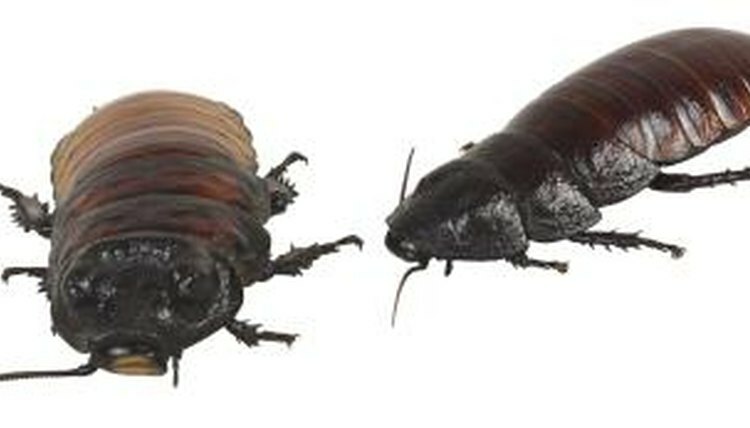 A key difference between roaches and beetles is that cockroaches lack the thick, hardened forewings that most beetles possess. A cockroach’s mouth is also arched downward and backwards so that it is not visible if viewing the insect from above. In addition, cockroaches have six legs and two antennae. Developing cockroaches resemble adults but are smaller and do not have wings. Cockroach species can range in size, but the majority of adults are between 1 and 2 inches long. Crickets by comparison are under 1 inch, as are many beetle types. Tropical species of cockroaches tend to be larger than those found in colder climates. The Brazilian giant cockroach, for example, is one of the largest species of cockroaches with females growing up to 4 inches long. Male Brazilian giant cockroaches are generally 3 inches long. Most cockroach species prefer homes and restaurants to outdoor environments. They typically are drawn to warm places and tend to cluster in cracks, cabinets, under furniture, drawers and kitchen sinks. Some species, such as the brownbanded cockroach, enjoy particularly high areas in homes, such as behind pictures and clocks. The American cockroach prefers moist places and has a fondness for fermenting foods, such as bread soaked with beer. Oriental cockroaches are commonly found in dark, damp place like basements, cellars, crawl spaces and sewers. Unlike most insects, many cockroach species emit unpleasant odors and also produce sound. The Madagascar hissing cockroach is perhaps the most famous sound-producing cockroach. This insect rubs its legs together as part of its mating ritual and exhales air through its breathing holes, creating a hissing sound. The Madagascar hissing roach also uses the sound as an emergency alert when in danger. Other cockroach species produce quieter noises such as clicking and chirping. In the event of serious cockroach infestation, a strong musty or oily odor can also be present. Alicia Gallegos is a journalist in northwestern Indiana. She previously wrote for the "American Medical News, "a Chicago-based health newspaper published by the American Medical Association. She began her career at the South Bend Tribune, where she covered public safety, courts, food safety, education and health care. What Are the Stages of Beetle Development? What Type of Insect Is a Cockroach?